With many thanks to those individuals and organisations who gave kind permissions to reproduce excerpts or summaries from published articles. 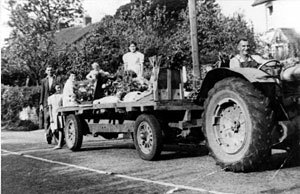 Thank you so much to all those villagers from Chew Stoke and environs who were kind enough to take the time to contribute their recollections and comments about the Chew Stoke Harvest Home - it has been wonderful to hear all your stories - thank you. You all know who you are and many of you have asked to remain anonymous! Introduction - "The Whoame Harras"
© Copyright 2012-2018, All rights reserved. Chew Stoke Harvest Home and Horse Show ("the Show") is organised and run by Chew Stoke Harvest Home Ltd ("the Company"). All Directors, Committee members and others connected with the Show are acting on behalf of the Company and all agreements with third parties are made on behalf of the Company. Precautions have been taken to ensure the safety of the public attending the Show. Admission is on the condition that the spectators agree and undertake to absolve the Company and every other person connected therewith from all liability for injury to any person or damage to or loss of property during the Show or any claim relating to goods purchased.